Vibrating Equipment Working with an aim to achieve the customer satisfaction, we are considered as one of the leading supplier and designer of Vibrating Equipment. The offered Vibrating Equipment is manufactured by our experienced team using finest quality material and modern techniques procured from certified vendors in the market. These Vibrating Equipment are widely demanded by various industries. Apart from this, Vibrating Equipment is checked on various standard quality parameters to ensure its international quality standards. We are offering this Vibrating Equipment at reasonable price to the clients. We are the leading manufacturer and supplier of the Vibrating Equipment. Offered range is known for its hassle-free operations and low maintenance requirements. These products are ideal for screening of wet and dry sand, crushed stone, plastics, gravel, ores, and minerals. Reciprocating Feeder Fostered with year of industry experience and market understanding, we are making and exporting an exclusive range of Reciprocating Feeder. The Reciprocating Feeder is used in various applications such as dosing, batching, mixing and etc. Manufactured by using finest quality raw materials procured from trusted vendors in the market, Reciprocating Feeder is available in different specifications. Reciprocating Feeder is widely demanded in market for its sturdy construction and best performance. Our clients can avail this Reciprocating Feeder at economical rate from us. SHAKTI ENGINEERS are presenting a new series of ROTARY VIBRATORS to meet the requirements of various industries, where in material handling plays a major role. SHREE SHAKTI VIBRATORS help to empty, ventilate, dose, remove dust, dehydrate, convey, loosen, mix, test, clean screen, classify, compact, distribute, feed etc. Worm Gear Boxes We are one of the most distinguished and the most celebrated company widely known all over india for manufacturing of worm gear boxes. All gearboxes are lubricated for long life and its range have been designed and built keeping in mind with today’s market demands. The design constitutes excellent heat dissipation, universal mounting, different coupling options and wide range of versions. Simplicity along with perfection is our prime goal therefore; these are designed with the assistance of our advanced technology and are made available at competitive costs. 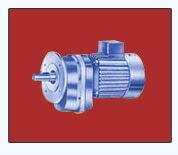 Geared Motors, Epicyclic Geared Motors, Epicyclic Geared Motor, Epicyclic Geared Motors Manufacturers, Epicyclic Geared Motors Suppliers from Mumbai, India. Epicyclic Geared Motors We are recognized as one of the eminent manufacturers and exporters of Epicyclic Geared Motors. We have advanced manufacturing unit, which help us during the manufacturing of geared motors. Acknowledged for their high reduction ratio, sturdy structure and impeccable performance, these Epicyclic Geared Motors gives very low RPM. Further, these geared motors are not advised for heavy duty applications. Moreover, we are committed to offer these geared motors to our valuable clients within stipulated time frame. Hollow Shaft Helical Geared Motors Running with a purpose of attaining highest level of customer trustworthiness, we are designing and exporting a distinctive assortment of Hollow Shaft Helical Geared Motors. These Hollow Shaft Helical Geared Motors create great motive force at low speed such as lifts, wenches and etc. Hollow Shaft Helical Geared Motors is manufactured by using tested quality material and modern components. In addition, our entire range of this motor is tested on various parameters to ensure its quality and functionality. We are offering these Hollow Shaft Helical Geared Motors at very reasonable price to the clients. We are the leading manufacturer and supplier of Hollow Shaft Helical Geared Motors. The motors offered by us are manufactured using topmost grade components and progressive technology in tandem with the industry defined guidelines and regulations. These Hollow Shaft Helical Geared Motors are offered by us at reasonable price to serve better in any condition.